“The Great One” helped define comedy in the Golden Age of television. 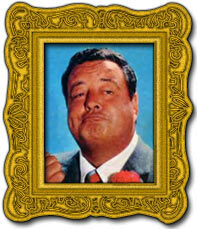 Jackie Gleason is considered one of the true pioneers of early television. He explored the limits of broad physical gesture and loud verbal bombast on the black and white five inch televisions of the 1950’s. His highly stylized blustering, prancing, smirking and double-taking led critic and screenwriter Gilbert Seldes to describe Gleason as “…a heavy man with the traditional belief of heavy men in their own lightness and grace.” Whether he was burning a finger, stubbing a toe or getting caught in a lie, Gleason’s work in the 50’s was a vital contribution to the invention of television comedy. Born in Brooklyn, New York in 1916, Gleason never pondered what he wanted to be when he grew up. As a young man he worked emceeing for small theaters. As word spread of the young brash kid who billed himself as “Jumpin’ Jackie Gleason” and could devastate any heckler with his quick wit, he became much in demand at theatres all over New York’s five boroughs. When he wasn’t doing stage shows, he worked as a radio disc jockey, a boxer, a daredevil driver and even a pool hustler (he would much later land an Oscar-nominated supporting performance as billiard king Minnesota Fats in The Hustler). And when he wasn’t working? He was drinking at Toot Shor’s Nightclub in Manhattan. But the Jackie we all know and love got his break on the DuMont Network’s Cavalcade of Stars in 1950. 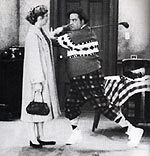 It was here that he was able to emphasize his talent with physical humor and create a bevy of characters that included Joe the Bartender and Brooklyn bus driver Ralph Kramden. When Gleason moved to CBS in 1952 for The Jackie Gleason Show, he showed the world “how sweet it is” when he sealed his fate as a national celebrity with a never before heard of 11 million dollar contract. In 1955, CBS expanded Gleason’s Honeymooners into it’s own half hour series and chances are, if you’ve turned on a television in the past five decades you’ve probably caught at least one episode of The Honeymooners. Sheriff Buford T. Justice in Smokey and the Bandit. It is rumored that he agreed to play the role of the southern sheriff because he knew of Burt Reynold’s reputation for insobriety and he figured it would be a good time. Gleason was prone to excess with wine and women- his marriage history included three wives and his drinking marathons with the likes of Frank Sinatra are legendary. Both of these passions may have been explained eloquently by himself when he said “Drinking removes warts and pimples. Not from me. But from those I look at.” His achievements also include immensely popular records such as the best selling Music for Lovers Only and composer of the theme song for The Honeymooners titled You’re My Greatest Love. In his house in Florida, he designed the barstools which he claimed were impossible to fall out of, no matter how hammered you got. A transcendent career of many great facets worthy of his great nickname which, incidentally, was bestowed upon him by drinking buddy Orson Welles. 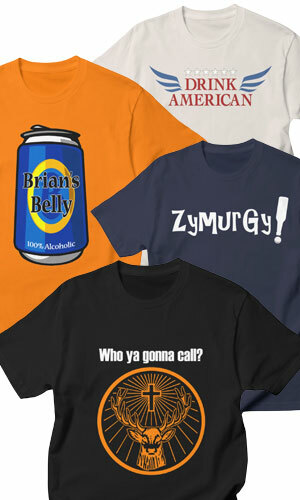 Gleason is no doubt the most respected inductee in the Brian’s Belly Hall of Fame. As the sincerest form of flattery, three of our other inductees have at one time or another imitated Gleason’s Ralph Kramden- John Candy on SCTV, John Goodman on Saturday Night Live and Kevin James on The King of Queens. Jackie Gleason was laid to rest in Florida in 1987 at the age of 71. On the steps leading up to the dais of his monument in St. Mary’s Cemetery read the immortal words “And Away We Go.” In August of 2000, an 8 foot bronze statue of Jackie Gleason depicting Ralph Kramden was placed in the Port Authority Bus Terminal in New York City. For more great insight on the Great One, visit Modern Drunkard Magazine.